New on the Menu There is a new menu entry that really improves work flow. It’s the Insert menu. You can insert an Image, Shape, Text area, a New Page or Page number. And you’ll notice another new entry at the top of the list, Content Catalog. 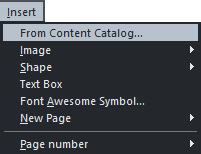 We’ll get to the Content Catalog and (Font Awesome Symbol) in a moment. Let’s explore the Insert menu in more depth. You can insert Images from a file, website, camera, or from the clipboard (or screen captures, or images copied from another source). I discovered that Insert > Image > From Web Address brings in the content of the whole page, text as well as all the photos and graphics and plops them down in place on your page! You can insert Shapes such as rectangles, ellipses, SmartShapes (more on these on the next page), arrows, text panels, speech bubbles. 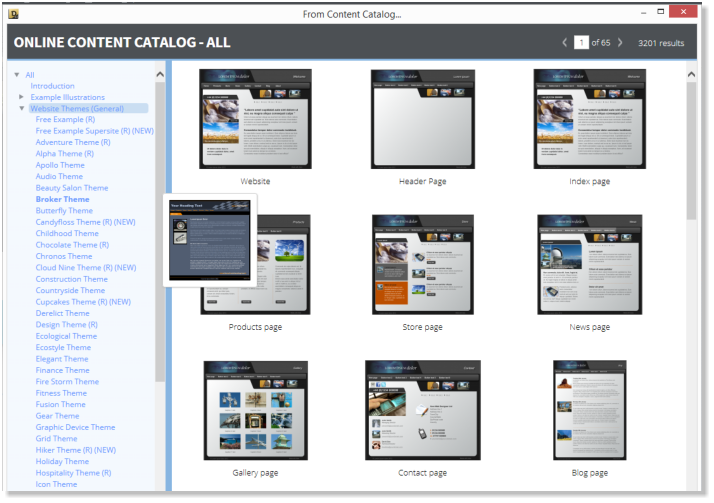 You can insert a Text Box (text area), a New Page including a blank page, a duplicate page, or a template page from the Content Catalog. And for long documents, you can insert a Page Number such as the page number at the bottom of each page in this review. The Insert menu is the place to go for adding content to your website. 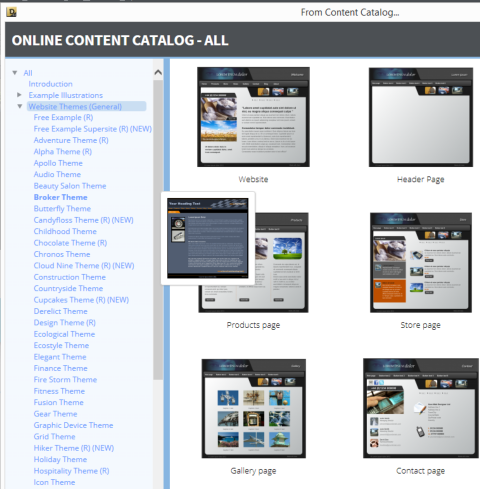 My screen capture above (Inserted using the Insert > Image > Screen Capture option) shows part of the Online Content Catalog, which includes all the content of the Designs Gallery, but exists in the Cloud and not on your computer until you “Import” some content. The Online Content Catalog is updated frequently and requires an Internet connection. If you prefer to work off-line, you can still access all the content in the Designs Gallery.